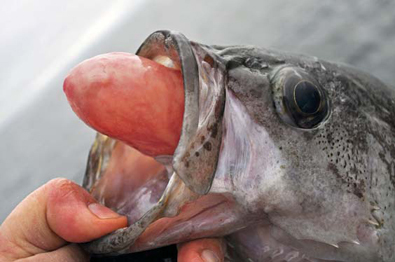 The stomach protrudes from the mouth of a barotrauma-impacted black rockfish. Anglers can reduce mortality in rockfish by employing deepwater release techniques. Beginning in 2020, all vessels sport fishing in the saltwaters of Alaska must have a functioning deepwater release mechanism (DRM) on board, and all rockfish not harvested must be released at depth of capture, or at a depth of 100 feet. Fishery Concerns and Solutions. Rockfish caught in deep water often sustain injuries — referred to as barotrauma — caused by rapid decompression and expansion of gases in the swim bladder. Fish that are released with inflated swim bladders cannot resubmerge and will die. Because of high release mortality,intentional catch-and-release fishing is greatly discouraged, particularly in depths of 60 feet or greater. Alaska anglers can best prevent wasteful rockfish mortality by avoiding waters where unwanted catches are likely. When rockfish are caught incidentally despite avoidance efforts, proper deepwater release techniques can reduce mortality. A recent ADF&G study found that survival of yelloweye released at depth was far higher (98 percent) than survival of fish released at the surface (22 percent). Avoid catching unwanted rockfish. When targeting other species, such as halibut or lingcod, rockfish bycatch can be greatly reduced by keeping jigs and bait 10-15 feet off the bottom. This has little or no effect on halibut and lingcod catch rates. Also, avoid fishing in areas with structure attractive to rockfish, such as boulders, ridges, and pinnacles. Move to a different area if you are catching rockfish unintentionally. Target other species first: To harvest rockfish as part of a mixed bag, target other species first. This will allow you to retain any incidental rockfish caught as part of your limit, and minimize the number of rockfish released. Avoid excessive rockfish harvests: Rockfish have a freezer life of about four months, so harvest only what you are likely to eat in the near future. Use release-friendly tackle: When fishing with bait, use a single circle hook. Circle hooks are less likely to cause injury by being deeply swallowed, increasing the chances of survival for released fish. Although rockfish caught in deep water suffer injuries due to decompression, survival can be improved substantially by releasing rockfish at the depth of capture. Pelagic rockfish caught in less than 60 feet of water are usually able to submerge on their own. If the fish appears to be inflated or otherwise unable to swim, use a deepwater release device to return the fish to the depth of capture. A variety of deepwater release devices, or recompression tools, are available commercially. 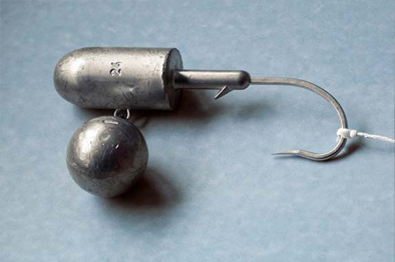 Anglers can also make their own deepwater release devices out of simple leadhead jigs. Note line attached to hook bend to facilitate deep release. Also, a barbless hook is used to facilitate release. Have device assembled and ready to use before you start fishing. The fish’s odds of survival are increased by minimizing time at the surface. Consider dedicating an old rod and reel or downrigger for this purpose. DO NOT vent or “fizz” rockfish! Venting or “fizzing” involves puncturing the stomach protruding from the fish’s mouth, or puncturing the fish’s body to let air out of the swim bladder. This practice can lead to infection in the body cavity and eventual death. Reel fish in quickly. Reeling slowly does not prevent inflation of the swim bladder. Send fish back down as quickly as possible. Return fish to depth of capture or 150 feet, whichever comes first, to ensure complete recompression. In some areas anglers may be required to retain the first one or two non-pelagic (PDF 1,071 kB) rockfish caught. Pelagic (PDF 962 kB) rockfish caught in less than 60 feet of water are usually able to submerge on their own. If the fish appears to be inflated or otherwise unable to swim, use a deepwater release device to return the fish to the depth of capture. Make sure your release device is ready — rockfish are most likely to survive when time at the surface is minimized. With practice, rockfish can be released within two minutes of reaching the surface . Reel the fish up as quickly as possible. After unhooking it, hook the release device through soft tissue on the lower jaw. Make sure the hook does not have a barb. Release the anti-reverse on the reel so line can spool out freely. Swing the fish slightly to one side and let go of the jig. Let line out as the weight pulls the fish back to the bottom. When the jig hits bottom, lock the reel and give a hard tug to release the fish.